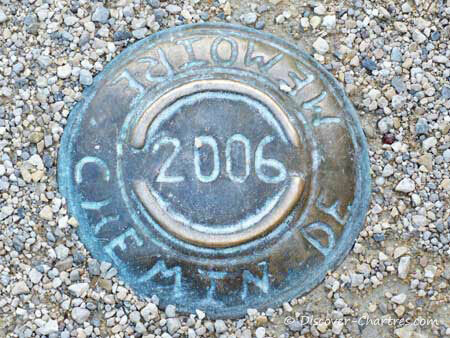 A round metal plaque embedded on the ground with Chemin de Mémoire 2006 engraved on it. Not only one... I saw series of plaques along Esplanade de la Resistance, where I sat down on a bench to see people passing by. Guess it was wrong... recently I discovered that those series of round metals leads us to monuments and commemorative plaques. It's a Path of History that was build in the memory of patriots and heroes who died for France and the liberty. Today I took my kids to city center to have a new experience - walking Chartres Path of History. "On va tracer les Chemin de Memoire", they were so excited! Following the a row of plaques on the ground to find something was just like playing detectives for them. They used to play this game at school when they were in nursery school. The tour itself starts from square Hélène-Boucher, just next to Chartres theater. We found our first monument - but they would not let me photograph the monument without them in the frame... They said "wait mom...we´re reading!" 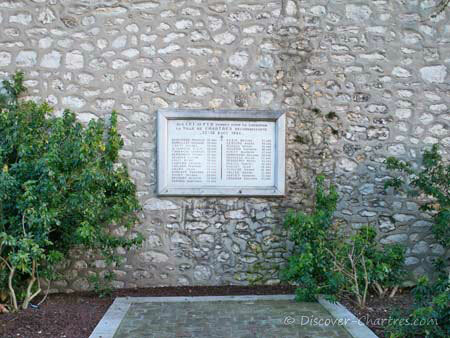 There are three plaques on one block of stone, the one which tribute to Marshal Jean de Lattre de Tassigny is in the middle. This monument was inaugurated in 1996. Still at the same place, three other monuments tribute to General Koenig, General Leclerc and General Juin. 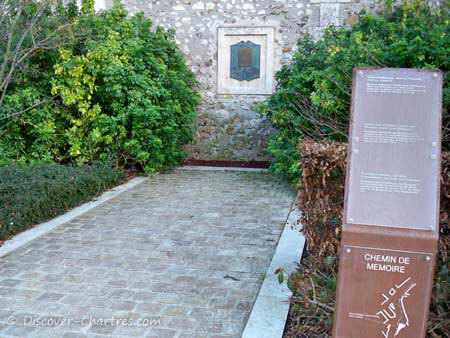 You should then follow the metal plaque marked with Chemin de Memoire, as seen on the photo above, to go the next monument. You just need to walk along the boulevard de Chasles sidewalk then cross the street to find Place des Epars. 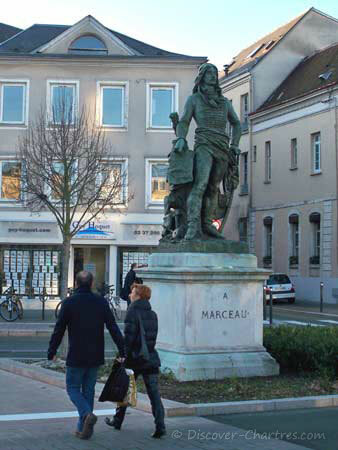 Here is our second stop - the statue of General François Séverin Marceau, an admirable young general who was born in Chartres in 1769. The statue was inaugurated in 21 September 1851, as can be read on its base. It was transferred to a safe place in October 2003 during the city renovation and replaced to its initial place with a ceremony in June 2006. Our next direction will be the Esplanade de la Résistance - four monuments and commemorative plaque are set up in this area. 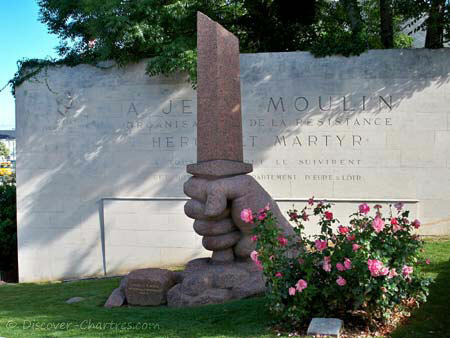 First, you will find the monument in granite in the form of fist holding a broken sword. 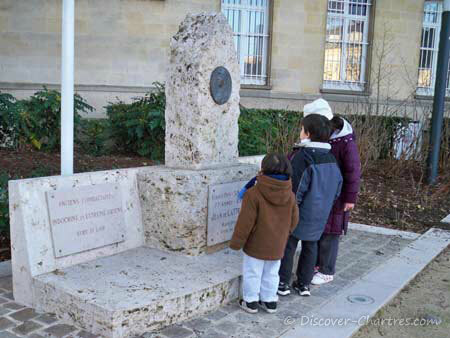 This monument tributes to Jean Moulin who was also the prefect of Eure et Loir. The ashes of martyrs of concentration camps was laid on the foot of the monument. If you ever see rose color roses here - Michel Kriloff has created and dedicated the roses for women who has been deported to Ravensbrück. Vive l´Amérique, vive la France, vive la Liberté plaque - tribute to American soldiers who died for Chartres liberation. This plaque was formerly installed in Bishops Palace Garden before it was finally transferred here in 2006. Now we continue our Path of History and walk towards our seventh stop. 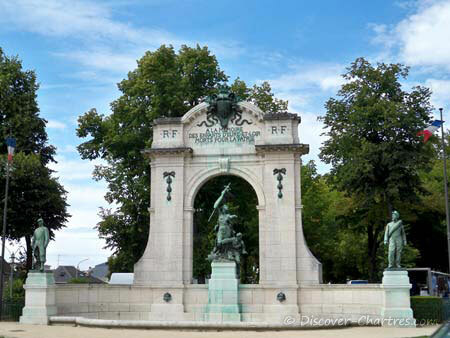 It is a monument which was created in 1895 in memory of children of Eure et Loir who lost their lives for their homeland during 1870 to 1871 war - as it carved on the top of 10 meters high edifice. Oh... I forgot to indicate that this monument is situated in the entrance of la Butte des Charbonniers, just in front of Place Chatelet. Then we move towards a monument in memory of veterans in North Africa. 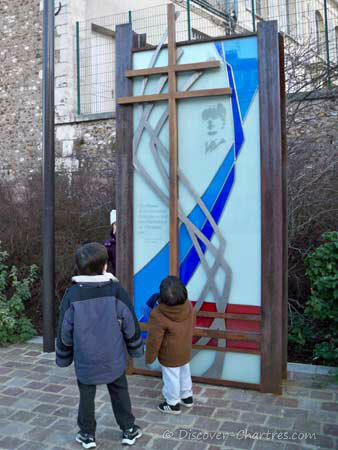 This monument was created in early November 2006. 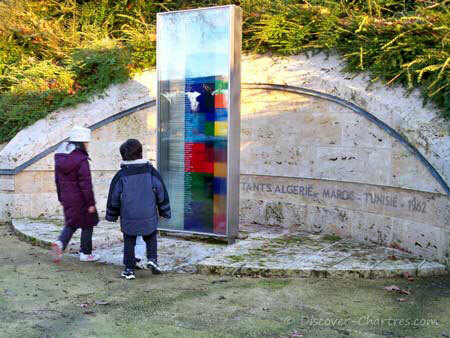 Aux morts pour la Patrie - is the last monument on Chemin de Memoire. This monument was built in 1921 to pay tribute to the people of Chartres, Chartrains, who lost their lives during the Great War. You can read the names of the civilian victims engraved on the main wall while the military victims on the inclined plane on the steps of the monument. 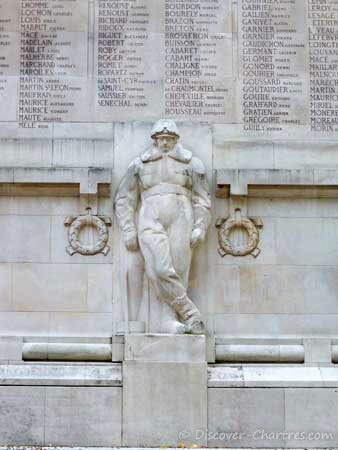 Five statues are placed in front of the central wall - an infantryman, a cavalryman, an artilleryman, a pioneer and an aviator. Our walking tour to Chartres Chemin de Memoire ended here. It took more than two hours for us... it was longer than if you do the guided walking tour proposed by the Chartres tourists office. Well, it needed additional times to photographs them! See my Chemin de Memoire photos collection and map here. 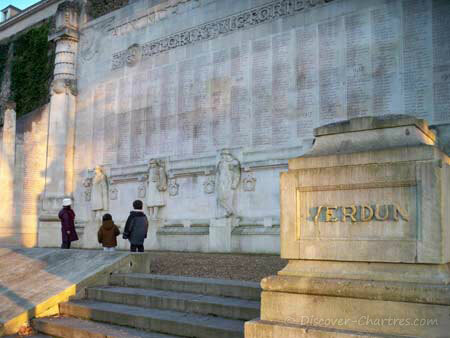 You can do the Path of History walk by yourself or if you prefer with guides, please contact Chartres Tourism Office. Next time when you are in Chartres and see a round metal plaque embedded on the ground... now you know what it is!